Are you in the market for a new truck this summer or fall? Three options, the Ram 1500, the Chevy Silverado 1500 and the Ford F-150, easily rise to the front of the options, providing excellent choices for your purchase. A closer look at the specifications of each truck will help you decide which is best for your needs. Read more on each of the technical specifications: Dodge Ram 1500 vs. Chevy Silverado 1500 vs. Ford F-150. Considered the most comfortable ride among the full-sized pickups currently on the market, the 2015 Ram 1500 features a coil-spring rear suspension to provide drivers with that comfort. While it has plenty of strength to make it a good work truck, it also has a cab that rivals a luxury sedan for comfort and quietness. The truck features a 305 horsepower 3.6-liter V6 engine standard, with the option to upgrade to the 5.7-liter Hemi V-8 which generates 395 horsepower. Another option, the more efficient 240 horsepower 3.0-liter turbo-diesel V-6 is also available in the Ram 1500. The truck has an EPA estimated 15 mpg city, 21 mpg highway, so it is a fairly efficient model as far as trucks go. The standard truck has a 57.5 cubic foot cargo space in the truck bed. Choosing a Ram 1500 is challenging because of the number of options. The base model is a two-door, 2WD that seats up to three people, but a four-door, 4WD option is available. A variety of trim packages are available as well, ensuring that you can find a truck that matches your needs and style. If you are looking for a comfortable, yet work-worthy truck with a smooth ride and spacious interior, the Ram is worth considering. Made from roll-formed steel with standard bed rail protectors, the Chevy Silverado 1500 is a truck designed to work hard. The truck comes standard with a 4.3-liter V-6 that generates 285 horsepower and 305 lb-ft of torque, which achieves an impressive 24 mpg on the highway. For those who need greater hauling or towing capacity, the rugged truck offers 5.3-liter and 6.2-liter V8 options. The Silverado has an impressive 61 cubic feet of cargo room in the bed on the regular cab standard model. A responsive steering system that rivals that of a passenger car makes the truck a pleasure to drive, even though it is designed for rugged work. It accelerates quickly, going from 0 to 60 in just 5.7 seconds. It currently ranks just below the Ford F150 in popularity, and slightly above it in price for the base model, making it one of the best-selling trucks on the market today. In 2015 the Ford F-150 is the top-selling full-sized truck. In its attempt to take this spot, Ford introduced the aluminum design in 2015. the new F-150 features an aluminum bed and steel body, reducing weight by 700 pounds in the truck without sacrificing strength and durability. The standard engine in the F-150 is a 3.5-liter V6 generating 282 horsepower, with options for a 2.7-liter EcoBoost V6, a 3.5-liter EcoBoost V6 and a 5.0-liter V8 available. The base engine is rated at 18 mpg city and 23 mpg highway. While the interior of the truck is fairly spacious, the standard model, which has just two doors, makes getting an adult in the rear seat difficult. The truck, in spite of its light weight, has a smooth ride and behaves on the road much like a car, with excellent steering. In spite of its overall reduced weight, the F-150 is rated to carry a 1740 pound payload in its 62.3 cubic foot bed. The engine, however, does not sound like a powerful truck engine, something that truck enthusiasts may not like. The larger engines for the F-150 that have a better “truck sound” have very poor fuel economy. No matter which of these trucks you choose, you will have a truck designed for work with features that protect your comfort. That is a winning combination no matter how you look at it! 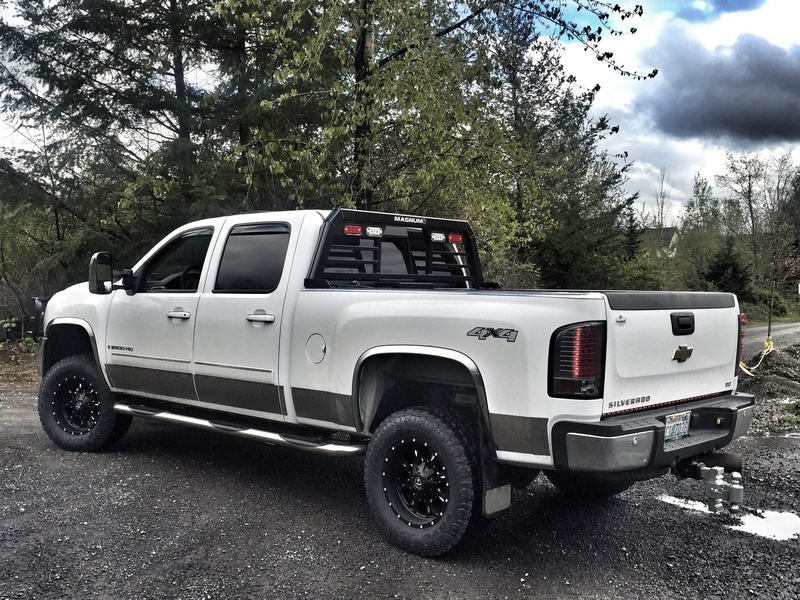 ← Enter for Your Chance to Win a Magnum Truck Rack!